Simple Mills offers natural low-sugar, high-protein, gluten-free, non-GMO alternatives for traditional foods. I like that they do it without sacrificing flavor. I made the banana muffins (but in a bread pan) at the same time I made homemade banana bread with actual bananas. I didn't tell my husband and had him to taste both breads, one at a time. He actually thought the Simple Mills mix was my recipe. It wasn't until I revealed to him that it was in fact a box mix that he knew. He said the bread was really good and he had no idea. I too was surprised because many times with baked goods you can tell when they are gluten-free right away. I would say Simple Mills did a great job making their products taste as natural as possible. I have actually found that in my house if I don't tell my family ahead of time it works out better. I used the waffle mix for my kids for breakfast and they ate them just the same as any other waffles I've made. I actually kept the crackers to myself because I've been eating them with cheese for an afternoon snack. The sea salt gives them a nice flavor too. Simple Mills uses ingredients like almond flour, coconut flour, cassava flour, flax, arrowroot, cocoa, and coconut sugar in place of traditional ingredients you normally find in everyday products. You can learn about these ingredients on their website if you want to know more. 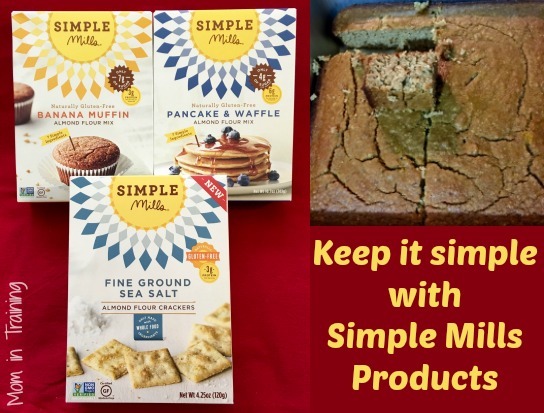 Simple Mills has created great tasting choices ranging from pancake and waffle, pizza dough and artisan bread/muffin mixes to a full line of specialty crackers – all getting rave reviews not only for their quality ingredients but also for their great taste, and outselling other natural food brands (available in over 3,000 stores) wherever the products are sold.